At Paint Inspection Ltd we pride ourselves on having relevant qualifications to be able to complete inspection and survey work even in the most challenging of places. Our team of inspectors hold various certificates enabling them to work in different environments. In certain circumstances it may not be possible either logistically or financially to erect scaffolding or towers to complete certain works so the ability to work at height off ropes is essential, our IRATA qualified team makes this work possible whilst minimising the costs associated with implementing a temporary working platform. Rope access was originally developed from caving and mountaineering techniques, and adapted to suit an industrial environment, to serve the offshore oil and gas industries. Over the past 25 years this form of access has been developed further and regulated under the Industrial rope access trade association (IRATA). With 2013 recording 16 million hours worked worldwide, this form of access in now commonplace in most industries. At Paint Inspection Ltd we have our own rope access division, our rope access inspection teams always work to IRATA guidelines and our operations are always overseen by a Level 3 supervisor. For surveying purposes Rope access is ideal, it allows our inspectors to gain access to a structure with minimal disruption to other trades, traffic and without the need for costly scaffolds or access equipment. It also allows a coating condition report to be carried out prior to a project starting or costly scaffolds being erected. This enables our clients to provide its contractors with the accurate information about the works which need to be carried out. The more accurate information at tender phase ultimately impacts the success of a project. Our coating condition surveys can be carried out via rope access to meet the requirements of the necessary standards on a range of structures from offshore substations, large vessels, rail and highway structures. Confined Space work also presents many challenges and it is vitally important that these works are completed by qualified inspectors to ensure safety and quality. 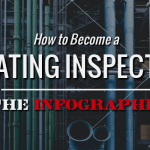 Paint Inspection Ltd has a team of inspectors that hold Confined Space Certification. We can also arrange rescue teams, removing all logistical issues associated with this type of specialised inspection and surveying work. Ultimately we can offer inspectors that hold Confined Space, IRATA, PTS, IPAF & Track Accustomed for London Underground, certification. Specialist access inspections are always a difficult field and Paint Inspection Ltd has often been asked for the ability to conduct inspection services at both height and subsea. The height was easy with a number of our inspectors holding the IRATA qualification. Subsea is a much more specialised field and as such underwater inspections are fraught with complications. Essentially this can only be completed visually. Samples can be taken and analysed at the laboratory but the question is how do you incorporate the skill set of commercial diving and ICorr/NACE inspectors, well the answer is HD streaming video and imagery using the latest sub surface technology. A recent meeting with a commercial dive company RS DIVERS also based in the Portsmouth region has seen a working partnership develop that allows Paint Inspection Ltd to offer a service like no other company, by teaming up a dive team with a ICorr/ NACE qualified surface contact we can home in on issues and take high quality images for analysis. This partnership not only has the ability to check corrosion and paint condition, the dive team also hold NDT tickets and has the ability to complete the inspections but also repairs if required. With our increasing portfolio of work and clients we find it essential to keep up with clients wants and needs and we feel that this increased service offers exactly what they are looking for. For more information on these specialist access services please don’t hesitate to call. Copyright © 2019 Paint Inspection. All rights reserved.